David Pablo Nalbandian (Spanish pronunciation: [daˈβið ˈpaβlo nalˈβandjan]; born 1 January 1982) is an Argentine retired professional tennis player who played on the ATP Tour from 2000 until his retirement in 2013. He reached a highest ranking in singles of world No. 3 in March 2006. Nalbandian was runner-up in the singles event at the 2002 Wimbledon Championships. During his career he won 11 singles titles, including the Tennis Masters Cup in 2005 and two Masters 1000 tournaments. Nalbandian is the only Argentine player in history who ever reached the semifinals or better at all four Grand Slam tournaments and reached the men's singles final at Wimbledon. He was a member of the Argentinian Davis Cup team who reached the finals of the World Group in 2006, 2008 and 2011. Nalbandian played right-handed with a two-handed backhand, which was known for being a devastating shot. Since his retirement, Nalbandian has taken up the sport of rally racing, and has competed in Rally Argentina. 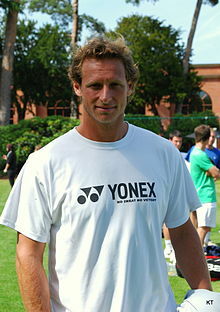 Of Armenian descent, David Nalbandian was born in the small city of Unquillo in Córdoba Province, Argentina. He became a professional tennis player at the age of 18. As a junior, Nalbandian reached as high as No. 3 in the world in December 1998 (and No. 5 in doubles in 2000), soon after winning the US Open boys' singles final over fellow junior Roger Federer. He turned professional in 2000. In 2001, he finished in the ATP top 50 for the first time. He finished 2002 as the No. 1 Argentine and South American for the first time in his career, winning two ATP titles and reaching the Wimbledon final, where he beat David Sánchez, Paul-Henri Mathieu, George Bastl, Wayne Arthurs, Nicolás Lapentti and Xavier Malisse before losing to Lleyton Hewitt. Nalbandian did not reach another major final in 2003. He did however have an impressive run at the U.S. Open, taking out both of the Wimbledon finalists, 20th seed Mark Philippoussis and second seed Roger Federer, on the way to a semifinal matchup with Andy Roddick. It was the second time in less than a month that he had met Roddick in a high-stakes match, having lost to him in the final of the Rogers Cup a few weeks earlier. Nalbandian started strongly, taking a two sets to love lead, and held a match point in the third-set tiebreak. There was a little bit of controversy during the match, when a fan yelled "out" at 7–7 in the tiebreak, causing Nalbandian to mishit his following shot when he thought the linesman was the one who called it. Roddick took the point and eventually prevailed in the tiebreak. Ultimately, he was unable to finish the match off and eventually lost 6–7, 3–6, 7–6, 6–1, 6–3. He finished 2003 ranked No. 8 in the world. In 2004, Nalbandian achieved his best result at the French Open reaching the semifinals, losing to eventual champion Gastón Gaudio. Although he did not win any titles in 2004, he did finish runner-up at both the Rome Masters and the Madrid Masters, where he was completely overpowered and outclassed by Carlos Moyá and Marat Safin respectively. He broke into the top 5 for the first time in his career in August and finished 2004 ranked as the World No. 9 player. In 2005, Nalbandian advanced to the quarterfinals of the Australian Open, Wimbledon, and the U.S. Open. He also won the Tennis Masters Cup, becoming only the second Argentine tennis player in history (after Guillermo Vilas in 1974) to win the year-end tournament. Having replaced Andy Roddick, he won two of his three group matches (to Federer, Ivan Ljubičić, and Guillermo Coria). In the semifinals, he defeated Russian Nikolay Davydenko, and in the final, he beat World No. 1 Roger Federer in a fifth-set tiebreak after coming from two sets down, with Federer succumbing to a right ankle injury after laboring out the first two sets in tiebreaks. Nalbandian became the first player to win the cup without previously attaining a Grand Slam or Masters Series title. In January 2006, Nalbandian beat Fabrice Santoro of France, 7–5, 6–0, 6–0, in the quarterfinals of the Australian Open, becoming, at the time, only the second active player (along with Roger Federer) to have reached the semifinals of each Grand Slam tournament. He lost in the semifinals to Marcos Baghdatis in a hard-fought five-set match, despite holding a two-set-to-love advantage and four games to two in the final set. In May, he won the Estoril Open Tournament in Portugal for the second time, being one of only three men to achieve this accomplishment (Carlos Costa, 1992 and 1994; and Thomas Muster, 1995 and 1996). One month later, Nalbandian reached his second French Open semifinal. It was the only time in his career that he reached two Grand Slam semifinals in one calendar year. He played Federer and started strongly, winning the first set 6–3 and going 3–0 up in the second set. At 5–2 down in the third set, Nalbandian decided to retire from the match due to stomach injury. At Wimbledon, Nalbandian was beaten in the third round, where he lost to Fernando Verdasco in straight sets. At the US Open, Nalbandian was beaten in the second round by Marat Safin. Nalbandian then competed in the Davis Cup semifinal tie against Australia. David easily won against Mark Philippoussis, 6–4, 6–3, 6–3, to give Argentina a 1–0 lead. Argentina went on to win 5–0 to reach the Davis Cup final. Later in the year, Nalbandian reached semifinals at the Masters Series Madrid and the Masters Cup, where he lost to Roger Federer and James Blake, respectively. Despite winning both of his single rubbers in the Davis Cup final against Safin and Nikolay Davydenko, Nalbandian could not stop the Russian Davis Cup team. Argentina went on to lose 3–2. 2007 saw Nalbandian drop out of the world's top 20 for the first time since 2003, after losing in the fourth round of the 2007 French Open to Nikolay Davydenko. Nalbandian suffered various abdominal injuries, a back injury, and a leg injury during the year. He fell to no. 26 in the world, until his season changed after winning the 2007 Madrid Masters. He won the tournament by defeating second seed Rafael Nadal, third seed Novak Djoković, and top seed Federer in consecutive rounds, becoming the third player after Boris Becker and Djoković to defeat the world's top three players in a single tournament. He defeated Nadal, 6–1, 6–2, in the quarterfinals. His good form carried him to his second top-3 win of the tournament, defeating Djoković in the semifinals. He stunned Federer in the final, 1–6, 6–3, 6–3, and reached the doubles semifinals with Guillermo Cañas in the tournament, before losing to top-seeded brothers Bob and Mike Bryan in the semifinals. After the tournament, his singles ranking moved up from no. 25 on the tour to No. 18. He played at the 2007 Paris Masters and again defeated Federer, in the third round 6–4, 7–6. He beat David Ferrer in the quarterfinals in a closely fought match, 7–6, 6–7, 6–2. After beating Richard Gasquet, 6–2, 6–4 in the semifinals, Nalbandian won his second straight ATP Masters Series title over Rafael Nadal, 6–4, 6–0, thus, becoming the first player to win the Madrid and Paris Masters back to back since former world no. 1, Marat Safin in 2004. This win allowed him to move back into the world's top 10 at No. 9. After the Paris Masters, Nalbandian became the first player to defeat No. 1 and No. 2 players in consecutive tournaments and win them. Nalbandian began his 2008 season back in the top 10. However, at the Australian Open, he failed to reach the quarterfinals, suffering a 6–1, 6–2, 6–3, loss to the 22nd seed Juan Carlos Ferrero in the third round. On 24 February 2008, he won the Copa Telmex in Buenos Aires, beating José Acasuso, 3–6, 7–6, 6–4, in the final. With that win, he moved to World No. 8. The following week, He arrived at the Abierto Mexicano Telcel in Acapulco, Mexico and cruised all the way to the finals, along the way defeating Boris Pašanski, Santiago Ventura, Potito Starace, and Luis Horna, beating them all in straight sets, but then lost in the final, to Spaniard Nicolás Almagro, 1–6, 6–7. He entered his first ATP Masters Series tournament of the year at the 2008 Pacific Life Open, and received a bye in the first round because of his seventh seeding. In the second round, he defeated Ernests Gulbis 6–4, 4–6, 7–6, and then came back to beat Radek Štěpánek 7–6, 0–6, 7–6. In the fourth round, he avenged his defeat by beating Juan Carlos Ferrero, to whom he lost earlier in the year at the Australian Open, 6–2, 6–2. He lost, however, in the quarterfinals against Mardy Fish 3–6, 7–6, 6–7, in a very close match. He lost at the Monte Carlo Masters to eventual finalist Federer, 7–5, 2–6, 2–6. In Barcelona, he was the third seed, but was eliminated by Stanislas Wawrinka in the third round. At the 2008 Rome Masters, he fell in his opening match to Almagro, 4–6, 5–7. At the French Open, Nalbandian suffered a shock loss in the second round to Frenchman Jérémy Chardy. After being two sets up and seemingly in control, he lost the next three to hand Chardy the win 6–3, 6–4, 2–6, 1–6, 2–6. He also suffered early exits from both Wimbledon and the US Open, losing in the second round and third round, respectively. His indoor season, however, was a success, as he won his ninth career title at the 2008 Stockholm Open, defeating Robin Söderling 6–2, 5–7, 6–3, in the finals. He was defending champion at the Madrid Masters, but was quickly eliminated by fellow Argentine Juan Martín del Potro in the third round. He then entered both the Davidoff Swiss Indoors and the BNP Paribas Masters, where he was once again the defending champion. He did not win either of these tournaments, but found himself in the finals of both. To end the year, he participated in the 2008 Davis Cup and was up on an opening match against David Ferrer. Despite a victory, he ended up on the losing team against Spain in the Davis Cup finals in Argentina (The Argentine team lost 1–3). He made some offensive comments in the press against Spain, the Spanish tennis team, and Rafael Nadal. It was rumoured that he and Agustín Calleri were involved in a fight after they lost their doubles rubber. Nalbandian denied this. He was fined $10,000 for leaving the stadium after his and Calleri's defeat in doubles to Spaniards Fernando Verdasco and Feliciano López, and for his refusal to appear at a subsequent press conference to comment on the Argentine team's setback. Nalbandian started his 2009 tour by winning his tenth career ATP title at the Medibank International in Sydney, Australia, after defeating Finland's Jarkko Nieminen, 6–3, 6–7, 6–2, in the final. At the Australian Open, he defeated Marc Gicquel in the first round, 6–1, 4–6, 6–2, 6–3, before being upset by unseeded Taiwanese player Lu Yen-Hsun, 4–6, 7–5, 6–4, 4–6, 2–6, in the second round. At the 2009 BNP Paribas Open in Indian Wells, California, he lost to World No. 1 Rafael Nadal, 6–3, 6–7, 0–6, in the fourth round for the first time, failing to convert on five match points in the second set. In May, he announced that he would have to undergo a hip surgery, resulting in not being able to compete in the remaining Grand Slams and the Davis Cup. In August, he announced that he would return to practice and eventually to competitive tennis at the Australian Open in January. A few days before the beginning of the tournament, he was forced to withdraw from the event due to an abdominal injury. Because of several knee injuries in the early part of the 2010 season, he finally made a return, beginning at the 2010 Copa Telmex, his hometown tournament. He beat Potito Starace in the first round 6–2, 7–6, over a period of two days due to a rain delay. In the second round, he beat Daniel Gimeno-Traver 6–7, 6–4, 7–6. However, he pulled out of his quarterfinals match against fifth seed Albert Montañés due to a right leg injury. He made a return to tennis by playing doubles for Argentina in the Davis Cup against Sweden in Stockholm, which he won in straight sets. He played the deciding singles rubber, defeating Vinciguerra 7–5, 6–3, 4–6, 6–4, and helped Argentina reach the quarterfinals. Playing in his first Masters Series event since Monte Carlo the previous year, he appeared at the 2010 BNP Paribas Open in Indian Wells. There, he won his first round match against Stefan Koubek, 6–2, 7–6. In his next-round match, he played 22nd seed Jürgen Melzer and lost 4–6, 1–6. He then entered the 2010 Sony Ericsson Open in Miami as a wildcard entrant. He beat Łukasz Kubot 6–3, 6–2, and 30th seed Viktor Troicki 6–3, 4–6, 6–4, before falling to the fourth seed Rafael Nadal in three sets 7–6, 2–6, 2–6. He entered the 2010 Monte-Carlo Rolex Masters in Monaco, ranked No. 151 in the world, beating Andreas Beck in straight sets, before coming through 3–6, 6–4, 7–6 against World No. 13 Mikhail Youzhny of Russia in the second round. Nalbandian beat Tommy Robredo, before losing in the quarterfinals to the second-ranked Novak Djokovic 2–6, 3–6. Nalbandian withdrew from the 2010 Internazionali BNL d'Italia with a right leg injury. The injury persisted, and he withdrew from the 2010 Mutua Madrileña Madrid Open, the 2010 Roland Garros and the 2010 Wimbledon Championships. In July, he played two singles matches for Argentina against Russia in the Davis Cup at the Olympic Stadium in Moscow. He defeated Nikolay Davydenko, 6–4, 7–6, 7–6, in the first rubber, and Mikhail Youzhny, 7–6, 6–4, 6–3, in the fifth and final rubber, giving Argentina a victory of 3–2 to qualify for the semifinals. He made his return in the 2010 Legg Mason Tennis Classic, where he won the title, his first since 2009 Medibank International Sydney after wins over Rajeev Ram, 6–4, 6–0, Stanislas Wawrinka, 6–3, 6–1, Marco Chiudinelli, 6–1, 6–0, Gilles Simon, 3–6, 6–2, 6–3, and Marin Čilić, 6–2, 6–2. He defeated Marcos Baghdatis in the finals, 6–2, 7–6, guaranteeing a jump in the rankings up to the vicinity of world no. 45. The following week, he had a successful run to the quarterfinals in the Roger's Masters Series in Toronto, defeating David Ferrer, Tommy Robredo, and Robin Söderling, before losing to World No. 4 Andy Murray after this 11-match winning streak. This run took his rank up to world No. 37. He competed at the 2010 BNP Paribas Masters, where he lost again to Murray, 6–2, 4–6, 3–6, in the second round. Nalbandian began the year ranked No. 27 in the world. As sixth seed in the Auckland Open, Nalbandian beat Fabio Fognini, Philipp Kohlschreiber, John Isner, and Nicolás Almagro, without losing a set. However, he lost in the final against David Ferrer. His performance propelled him to the rank of No. 21 in the world, while also achieving the no. 1 Argentina position at the expense of Juan Martín del Potro, who was also injured. He faced Lleyton Hewitt again. The match, dubbed the "Clash of the Titans", went in the fifth set as in 2005, but this time for Nalbandian, after 57 games. He saved two match points, but in the second round was forced to retire due to cramps and fatigue, 1–6, 0–6, 0–2, to Ričardas Berankis. After the Australian Open, he played in the Movistar Open. He began his tour on clay by beating his compatriot Carlos Berlocq, before losing against Horacio Zeballos. In Buenos Aires, he lost in the quarterfinals to Tommy Robredo. He played a Davis Cup match, winning in four sets against Romanian Adrian Ungur. Due to a torn hamstring and a hernia, he missed many tournaments including Indian Wells, Miami, Monte Carlo, Madrid and Rome Masters. He lost to Roger Federer in the third round of Wimbledon. In the Australian Open, Nalbandian had a five-set loss to Isner and was fined $8,000 for unsportsmanlike conduct following the match. On February, David participated in two Davis Cup matches for Argentina against the German team, defeating Florian Mayer in a singles match and then partnering with Eduardo Schwank to win a doubles match against Tommy Haas and Philipp Petzschner to help the Argentinian team advance to the quarterfinals. Afterwards, Nalbandian played a string of clay tournaments, reaching the quarterfinals in the Brasil Open, semifinals in Buenos Aires and a first round exit at the Mexican Open. He then entered the first ATP Masters 1000 tournament of the year, the 2012 BNP Paribas Open in Indian Wells, losing in the quarterfinals to Rafael Nadal. After the tournament, Nalbandian reached No. 40 in the ATP Rankings but failed to progress past the first round in the 2012 French Open as he was beaten by the Romanian, Adrian Ungur in four sets. In June, Nalbandian reached the final of the Aegon Championships at the Queen's Club in England for the first time. He led his opponent Marin Čilić by a set but, having been broken to trail 3–4 in the second, was disqualified when he kicked an on-court advertising board bordering a line judge's chair. The board flew off its hinges and struck the judge on the shin, causing a cut and drawing blood. The judge remonstrated with Nalbandian before being taken for treatment. After checking on the injured judge, the umpire disqualified Nalbandian to end the match, causing the crowd to jeer in disappointment. Nalbandian automatically forfeited his prize money and ranking points due to his conduct default. A maximum £8,000 (10,000 euro) fine was issued on site by the ATP Supervisor for unsportsmanlike conduct. In forfeiting his potential prize money of £36,114 [$57,350] plus the £8,000 [$12,560] conduct fine, he incurred a total loss over the weekend of £44,114 [$69,910]. He was additionally docked 150 ranking points by the ATP. Nalbandian was unseeded at the Wimbledon championships, which followed soon after, and was defeated in straight sets by Janko Tipsarević in the first round. He lost again to Tipsarević in the first round at the London Olympics. Nalbandian withdrew from the 2012 US Open due to a strained muscle in his chest, one day before his scheduled first round match against compatriot and 2009 champion Juan Martín del Potro. After the quarterfinal win over France in the Davis Cup, where he played doubles, he was forced to undergo an operation on his right shoulder, sidelining him for much of the 2013 season. On 1 October, he announced his retirement. Nalbandian has sought to continue a sporting career and has taken up Rallying in the Argentine Rally Championship. Since then his career has progressed to appearances in the Codasur South American Rally Championship and one appearance in the World Rally Championship. Mostly he races an Argentine specification Chevrolet Agile. Nalbandian was an all-court player and a very clean ball striker. He used powerfully struck, sharply accurate groundstrokes which had very low error-percentage. He had a decent, but not particularly dominating service game compared to top 20 players. His signature play was the wide drive that swings out of court on both sides, low and spinning. He could take high balls on the backhand and forehand side and return them with acute angles and low trajectories and used these skills with great tactical intelligence. His ground game was complemented by his anticipation, speed and ability to end points at the net. Nalbandian's trademark shot is his double-handed backhand down-the-line, which was often regarded as the best double-handed backhand on the men's tour. He often used it to set up a point, by either hitting a clean winner or forcing a weak return from the opponent. Nalbandian is also known to be one of the game's best returners. He was consistently able to knock balls back deep on the baseline time and time again to effectively set up the point or rip return winners off second serves, but he also had the ability to block it back deep when returning a more effective serve. He also used a "chip-and-charge" technique against the opponents' serves to surprise them. Early in his career, Nalbandian was considered one of the most talented young players on tour, and touted as a future star of the game, alongside the likes of Federer, Safin and Roddick. He was cited as the main rival of Federer at the time, having beat him five times consecutively from 2002 - 2003. However, injuries, lack of consistency and poor mental temperament, have been cited as his biggest weaknesses that have prevented him from achieving to his full potential. Therefore, it has been suggested that he is one of the biggest underachievers in the game. Many[who?] compared his playstyle and personality to that of Agassi, notably his timing off the groundstrokes, two-handed backhand and return of serve, as well as his occasional indifference towards tennis. ^ "Player profile – David Nalbandian". ATP World Tour. ^ "The Talented Mr. Nalbandian". tennis.com. 1 October 2013. Retrieved 21 January 2019. ^ "David Nalbandian: I really enjoy being back on the court" Archived 17 March 2012 at the Wayback Machine, The Armenian Reporter, 30 August 2010. ^ "David Nalbandian | Rankings History | ATP World Tour | Tennis". ATP World Tour. Retrieved 1 June 2016. ^ "Roger Federer beaten by David Nalbandian at Tennis Masters Cup". En.espn.co.uk. 1 November 2013. Retrieved 21 January 2019. ^ "Nalbandian denies Davis Cup row". BBC News. 24 November 2008. ^ "Nalbandian beats Baghdatis in Washington final". BBC Sport. 8 August 2010. Retrieved 9 August 2010. ^ Rothenberg, Ben, "Nalbandian Is Fined Following Overrule Controversy", New York Times Straight Sets blog, 20 January 2012; retrieved 10 February 2012. ^ Misery for Germany as Argentina dominate, DavisCup.com; retrieved 20 March 2012. ^ Doubles delight as Argentina seals victory, DavisCup.com; retrieved 20 March 2012. ^ Nadal Sets SF Showdown With Federer, ATPWorldTour.com; retrieved 20 March 2012. ^ a b c Matt Brooks, "Nalbandian kicked out of Queen's Club final for injuring line judge", Washington Post, 18 June 2012; accessed 19 June 2012. ^ Ornstein, David (17 June 2012). "David Nalbandian disqualified from Queen's final after kick". BBC News. Retrieved 18 June 2012. ^ a b c Tom Barclay, "Nalbandian in Queen's kick shame", The Sun, 17 June 2012; accessed 19 June 2012. ^ a b Simon Cambers, "David Nalbandian's kick to be investigated by the police and ATP",The Guardian, 18 June 2012; accessed 18 June 2012. ^ a b UKPA (United Kingdom Press Association), "Nalbandian fined £8,000 over kick," 18 June 2012; accessed 19 June 2012. ^ Tim Lewis, "David Nalbandian's anger management works...almost", Guardian, 25 June 2012; accessed 27 June 2012. ^ David Nalbandian pulls out of U.S. Open, sportsillustrated.cnn.com; accessed 7 June 2014. ^ "Nalbandian undergoes shoulder operation", DavisCup.com, 3 May 2013. ^ "David Nalbandian turns into a rally racer". Retrieved 25 July 2018. ^ "David Nalbandian - rally profile". Ewrc-results.com. Retrieved 21 January 2019. ^ "Former tennis star David Nalbandian flips rally car in spectacular crash". Abc.net.au. 8 November 2016. Retrieved 21 January 2019. ^ Does David Nalbandian have the key to beating Rafael Nadal? ", bleacherreport.com; accessed 7 June 2014. ^ "The secret of David Nalbandian's indoor brilliance" Archived 11 December 2008 at the Wayback Machine, sportingo.com; accessed 7 June 2014. ^ "Who are the Biggest Wasted Talents in Tennis?". Retrieved 4 December 2016. Wikimedia Commons has media related to David Nalbandian.